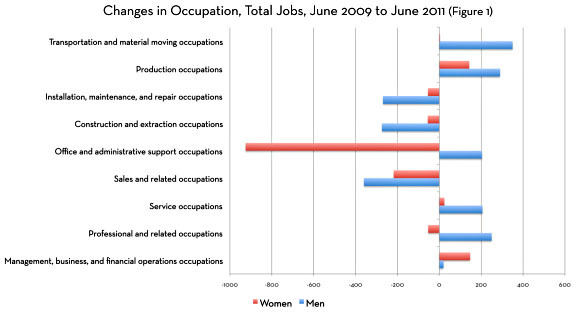 Women have been brutally hit when it comes to a category called “office and administrative support occupations,” i.e. those who make workplaces run smoothly….It falls on other workers to pick up the slack in offices where assistants have been let go. Americans have been working harder without seeing better pay or even new titles. Mother Jones recently reported that Americans put in an average 122 more hours than British workers and 378 more than Germans. As companies trim budgets, employers are “rationalizing” far more positions than usual. This leaves everyone else to pick up the remaining work. In a recent survey by Spherion Staffing, 53 percent of workers said they’ve taken on new roles. Just 7 percent got a raise or a bonus for doing so. The chart below tells the story. For the most part, though, I think it just puts some numbers to something all of us knew was happening already.